If using Gmail, be sure to click "View Entire Message" so you won't miss anything! 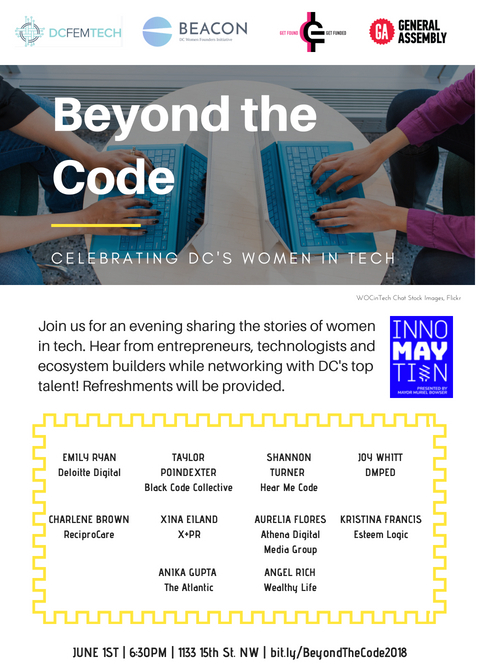 "Beyond the Code: Celebrating D.C.'s Women in Tech"
BEACON Grantee, Springboard Enterprises, will host its second in a series of Dolphin Tanks geared to support local and diverse women founders. 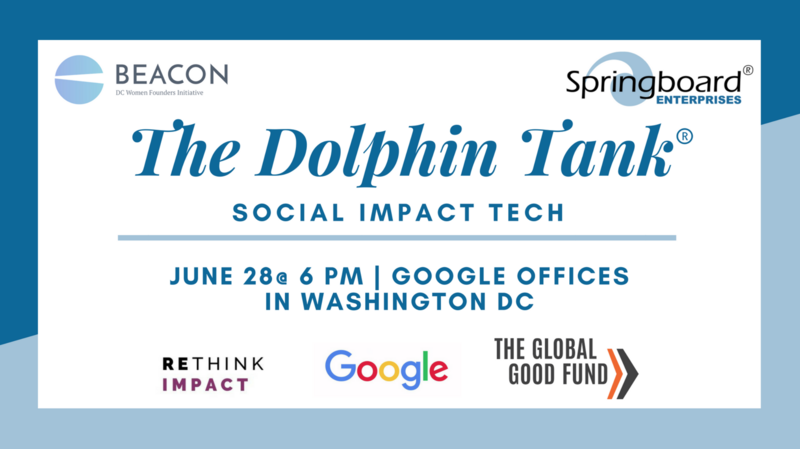 Join us alongside Rethink Impact, Google and The Global Good Fund and support companies that do well by doing good. Click here to RSVP or apply to pitch. Meet BEACON's Summer Research Assistant! BEACON has a new team member! Mary-Margaret Ewens, a rising second-year Master's student at Georgetown's Communication, Culture and Technology program, has a background in Communications and Journalism, as well as experience in writing, PR and social media management. Her interest in entrepreneurship stems from her family's experience in growing a number of businesses, as well as her own studies in business law and social impact. She hopes to work for startups in the future and hopefully, start her very own business! Mary-Margaret will support BEACON's Inclusive Innovation Fellow, Deloris Wilson, and BEACON Board throughout the summer. Help Create a Roadmap for Non-Tech Founders! Do you want to build a tech-enabled business but don't have a background in tech? Help BEACON Grantee, The Mentor Method and Esteem Logic, craft a DC-specific roadmap just for you! Your feedback is essential to making this a success. So, sign-up and share your insights on June 12th! Interested in partnering with us, or have some news to share? Submit a Partnership Request Form and/or email thebeacondc@gmail.com. We'll be in touch! The Global Startup Ecosystem is accepting applications for the Women's Digital Accelerator. Apply by 6/1. The National Coalition of 100 Black Women Inc. will award $1500 micro-grants to small, for-profit Black women-owned business. Eligible companies have under $500K in revenue and have been established for at least one year. Apply by 6/3. ABC's Shark Tank Casting Call will hear 500 entrepreneurs pitch in Washington, DC on 6/5. Entrepreneurs will be given one minute to deliver their pitch for the chance to be selected for the show. Only the first 500 people to arrive will get this awesome opportunity, so get there early! The Women Founders Network Fast Pitch Event awards $35,000 in cash awards plus professional services. Apply by 6/10. The Women in Economic Development and Civic Leadership Awards presented by Walker's Legacy Foundation will celebrate the achievements of multicultural women who champion the development of policy and programs to advance economic development, entrepreneurial ecosystems and job opportunities within their local communities. Know of someone deserving of a nomination? Nominate by 6/15. Techstars Startup Weekend Heroes Edition is open to all with the theme of startup ideas focused on first responders, military, firefighters, policemen/women, and their spouses. Whether you're a developer, designer, maker, marketer, non-technical or you're just looking for a team, sign-up and bring your startup to life in 54 hours! Register by 6/22. Conscious Venture Lab/ SHIFT Ventures' Urban Resilience | Smart Cities Program seeks to fund companies that improve the way we provide services in cities. Apply by 6/17. Pitch with Purpose is a global pitch competition celebrating and rewarding diverse founders who have committed their companies to social good. Learn more and apply by 7/31. The Vinetta Project is partnering with Booz Allen Hamilton to host a series of workshops focused on gaining access to the federal market. Register here if interested in (1) accessing federal market opportunities, (2) small business certification, (3) revealing "who's who" in the federal space, (4) Small Business Innovation Research (SBIR) and Small Business Technology Transfer (STTR) Programs, and more. The Greater Washington Hispanic Chamber of Commerce (GWHCC) and BloomShift will offer up to 25 hours of free digital marketing assistance for qualifying businesses. Any business registered in Washington, D.C. may apply but the program is designed to serve low and middle-income D.C.-based businesses who need marketing support to reach the next level. Learn more and apply now - rolling admissions are accepted until September 2018. The PeaceTech Accelerator provides an eight-week structured program in Washington, DC including mentorship, sprints, and tutorials for startups that apply technology to assist communities in conflict and crisis zones. The program covers all aspects of scaling up, with a focus on scaling using the cloud. Participants will receive $50k in credits for Amazon Web Services and a $15,000 cash investment. Click here to learn more - admissions are rolling and the program begins June 4th. Are you or a team member a Georgetown student or recent alumni of any Georgetown degree program? Apply for the Startup Hoyas Summer Launch incubator program to receive dedicated support, workspace at WeWork White House, a $4,000 stipend per team, intros to local investors and invitations to exclusive events. Learn more and apply soon - admissions are rolling and the program begins 5/31. Are you interested in building a tech venture without providing the technology? The FedTech program is a novel startup studio that identifies technologies from over 25 federal laboratories and universities, then builds teams and helps these teams find their market. There's no equity stake and no need to leave your day job initial. Click here to learn more and to view the 2017 highlight video. Applications for the Spring '18 cohort are now open. Are you a non-university researcher or company? If you are an entrepreneur doing significant research and development, you may be a great fit for I-Corps: a seven-week accelerator to prepare teams to bid on Federal SBIR grants. If interested, email thebeacondc@gmail.com for more information. 500 Startups wants to train accredited, underrepresented investors. Click here to learn more about the program and scholarship offers for "Venture Capital Unlocked: The Secrets of Silicon Valley." Ongoing: DCRA's Small Business Resource Center offers one-on-one consultation on an on-going basis. Sign-up for a time convenient for you. Ongoing: Every Monday is Maker Monday at SHOP MADE IN DC. Join anytime between 7am and 7pm for 10% off all food, beverages and more. Independent coworking available from 7am-5pm. El Camino Travel is the answer for millennials craving fresh, immersive, and intentional travel. We curate off-beat experiences for small groups to unique destinations. Our trips come with a creative photographer in tow so that our travelers can thoroughly enjoy their trip rather than be consumed in capturing it. As a Colombian-American founder, Katalina Mayorga never meant to start a travel company, but a quick conversation with a taxi driver in Guatemala dramatically changed the course of her life - steering her from international development to hospitality and eventually, tourism. El Camino Travel is the culmination of her experiences working throughout Latin America and creative obsession in connecting with the locals that make a destination tick. Have you heard of the city's newest co-working spaced exclusively for women? Meet The Wing - part home-base, part social club and now open in Washington, DC. The Wing opened its Georgetown location in April and caters to the entrepreneurial spirit of DC's women founders. In addition to offering co-working memberships, The Wing also engages its members through networking and community events with hosts including Kirsten Gillibrand and Cecile Richards, just to name a few. 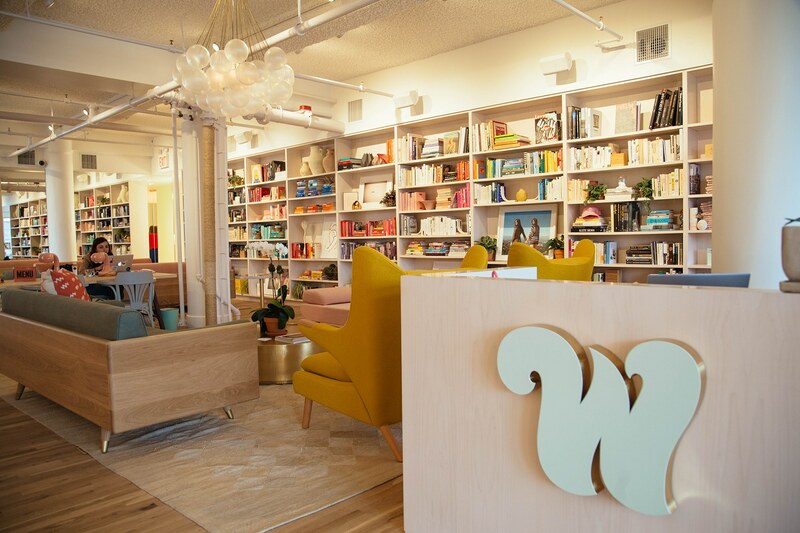 Through amazing amenities that include a lactation room for working mothers, a library dedicated to women authors, and beautifully decorated workspaces, The Wing seeks to support the "professional, civic, social, and economic advancement of women through community. [They] believe that the act of coming together as women creates new opportunities, ideas and conversations that will lead to greater mobility and prosperity for womankind." Interested in joining? Click here to learn more about membership options. Black Girl Ventures seeks a Communications Intern. The position is open immediately for full-time (preferred) or part-time availability, and for a 3-6 month term. For more information including a full description and requirements, email shelly@blackgirlventures.org. Nubian Hueman has multiple positions open including retail consultants, marketing interns, event volunteers, and more. Click here to learn more. Various opportunities include mentors, Are you interested in volunteering during D.C. Startup Week (Sep 24-28, 2018)? day of event logistics, marketing, speaker, and core team roles. Learn more and apply today! Are you interested in serving as a mentor? Empowered Women International is recruiting for mentors for the Entrepreneur Training for Success program. If interested in learning more, contact Alexandra Boycheck at alex@ewint.org. Mentors are needed in Rockville (English) and Herndon (Spanish). BEACON is also recruiting mentors to engage with local women founders. Click here for more. Angel Track is a masterclass and community for angel investors who are just getting started. They are specifically looking to support women and minorities interested in investing. Click here to apply for their Spring 2018 cohort. The Inclusive Innovation Incubator seeks part-time STEM instructors to teach coding and entrepreneurship curriculum to elementary, middle and high school students during after school, weekend and summer programs. Click here to learn more. Do you know of opportunities that could benefit the BEACON community? Share them with us via thebeacondc@gmail.com.